The 15th European Congress on Obesity is taking place in Budapest, Hungary this week. In the article European Congress on Obesity deals with bariatric surgery techniques, outcomes and metabolic benefits, I was surprised to read that "[s]pecial attention was needed in Eastern Europe where obesity rates are among the highest and particularly to the alarming increase in childhood obesity." I don't know about you, but when I think Ukraine or Azerbijan, I don't think obesity. How is it that Eastern Europe is growing fatter, faster than the rest of Europe? 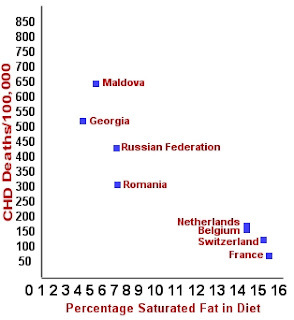 If countries in Eastern Europe are growing fatter, I have to wonder, do they also have high rates of CHD? In the United States, deaths from heart disease is 106.5/100,000. In the United States, our life expectancy is 77.85 years. I bet they eat too much fat in their diet! Ok, I bet they eat way too much saturated fat in their diet! Just some food for thought, since, ya know, we're repeatedly reminded to reduce our dietary fat, and especially our consumption of saturated fat; of course this is in an effort to not only keep our weight within normal, but also to reduce our risk for coronary heart disease (CHD). Data from MONICA and CIA World Factbook. Weight Loss, Cholesterol and Blood Sugar Improvements - What's the Wonder Drug Now? While the media is hot and heavy to lead their headlines with junk science complete with amateurish conclusions, a study was quietly published Friday in the journal, Molecular and Cellular Biochemistry - Beneficial effects of ketogenic diet in obese diabetic subjects (abstract) - that's remains ignored. No fanfare, no ballyhoo, in fact, not one headline to call attention to the significant findings, over the course of a year, of a dietary trial in obese subjects with and without type II diabetes. So, what exactly did the researchers have these subjects do that led to such impressive improvements over the course of 56-weeks? Sixty-four subjects were divided into two groups - thirty one had abnormal glucose levels (type II diabetes) and the remaining thirty-three had normal glucose levels. Both groups were instructed to modify their diet to include only 20g of carbohydrate a day from a list of foods allowed along with 5-tablespoons of olive oil on salads, and allowed 80g-100g of protein from meat, eggs, fish, poultry and full-fat cheese each day. No alcohol was consumed by participants. At week 12, participants were allowed to increase carbohydrate to 40g per day. Throughout the 56-weeks some foods were forbidden - flour, bread, rice, macaroni, noodles, honey, sugar, sweets, cakes, potatoes, all fruit juices and all soft drinks. Yes, shocker - the study was designed to measure the effects of a ketogenic diet in subjects with and without type II diabetes. So, with the above findings, it's no wonder this one is being quietly ignored. While the media, government policy makers and leading health organizations keep wishing for negative findings from studies of low carbohydrate diets, the opposite keeps happening - the pile of studies finding significant improvement keeps growing higher and higher. How profound were the changes in real numbers? 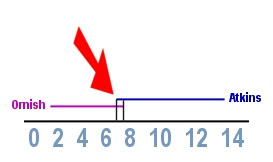 Those with diabetes had baseline fasting blood glucose levels of 188.64mg/dl; by the end of the trial, at week 56, their fasting blood glucose averaged 87.66mg/dl. Even those with normal blood glucose, who started with a baseline fasting blood glucose of 92mg/dl, saw improvement; at the end of the trial they had a fasting blood glucose of 85mg/dl. There is not one drug on the market today, recommended for those with diabetes, that shows such significant improvement in fasting blood sugar, sustained over a period of more than a year! Oh, but it gets better. Cholesterol improvements in this trial were unmatched by any drug trial. No cholesterol medication reduces LDL by 33% while also increasing HDL by 63.4%; and reducing triglycerides by 59%. If the above finding were for a new drug, not only would the headlines be screaming for everyone with dyslipidemia to be prescribed it immediately, but every last expert in the country would be making the rounds in the media to be heard about this new wonder drug! Sadly this isn't a new wonder drug rich with potential for profits. Instead it's simple dietary therapy, with no bottomline enhancement for anyone, save for a few farmers and ranchers. So no headlines, no urgent call to take a look at the data which validates previous studies, no demands for reviewing the evidence; nope, the powers that be will continue along, fingers in ears, singing "La La La" as they hope no one notices the mountain of evidence growing. If you have diabetes, or are at risk for developing diabetes, get to know what a carbohydrate restricted diet is and how to integrate it into your health management, it may save your life. A review of the actual numbers shows a reduction over the 56-week period from 4.681mmol/l to 1.006mmol/l - a 78.72% reduction in those with high blood glucose; and from 1.827mmol/l to 0.861mmol/l in those with normal blood glucose - a 54.01% reduction. A quick reminder - the FDA is awaiting comments on their proposed guidance document concerning Complementary and Alternative Medicine. It is Docket No. 2006D-0480 and the full-text is here: Draft Guidance for Industry on Complementary and Alternative Medicine Products and Their Regulation by the Food and Drug Administration. Be sure when you do to include Docket Number 2006D-0480 in your submission. Please carefully read the document and pay attention to the terminology used. The document, if approved, specifically medicalizes complementary and alternative therapies, along with the products, supplements, devices and even foods often part of those therapies. By using "treatment" rather than "therapy;" - "medical" rather than "modality;" the document terminology sets traditional and alternative approaches to well-being and health inside allopathic or conventional medicine in the United States and will regulate products currently protected by congressional legislation, in DSHEA (Dietary Supplement Health and Education Act of 1994). The document, if approved, effectively renders the DSHEA null-and-void, not by congressional mandate, but by a cunning use of terminology to eliminate the limitations the law imposes on the FDA in its current oversight of dietary supplements. Please take a few moments to add your comments that an end-run around congress is unacceptable - DSHEA was enacted into law after extensive public debate and only public debate, in the House and Senate - in our legislature - should preceed any change made to its mandates. If the FDA wants greater authority to regulate supplements they need to go to congress and make their case to amend DSHEA, not make an end-run around the existing legislation! When we hear the word "diet" we often conjure up thoughts of deprivation, hunger and the frustration of short-term attempts to lose weight. But "diet" also means how we eat on a daily basis - so the diet we eat to lose weight should, ideally, be the diet we eat for the long-term. I agree with this idea and strongly encourage those trying to lose weight to eat a dietary pattern they'll make habit over the course of their weight loss and beyond as they then maintain their weight. Where I disagree with this idea is in the idea that our macronutrient (protein, carbohydrate, fat) intake should be set by percentage of our calories, in strict ratios with each other, in an attempt to keep the equation "balanced" - up to 35% of calories from total fat, less than 10% (or less than 7%) of calories from saturated fat, 55-65% of calories from carbohydrate, and the remaining 10-15% of calories from protein. We're repeatedly told a "balanced diet" remains within these percentages of calories and to maintain them while in a calorie deficit if we're trying to lose weight; going beyond those percentages and consuming too much fat, saturated fat or protein is detrimental to our long-term health. Yesterday I closed my post with "The first, and most important rule you need to know in the "diet game" is eat your protein; and make it complete protein." Protein is the macronutrient we take for granted, underestimate the power of, and assume we get enough of each day in our diet. By undervaluing protein in our diet, by making the assumption that most people eat more than enough, we fail to focus on not only the building blocks of life itself, but the building blocks of our endocrine system - our hormone system. Without adequate intake of essential amino acids, we rob our metabolism of the building blocks to function normally. When we diet to lose weight, restrict calories and maintain the ratios suggested to keep our diet "balanced," we willfully starve our metabolism and endocrine system of the critical elements required to maintain function. This is because our requirement for protein, for essential amino acids, is not based on a simple percentage of calories, but on how much we weigh. If a woman, who is 5'6" tall, 30-years old and weighs 250-pounds goes to MyPyramid.gov, she'll be presented with a food plan providing 1,800-calories a day to gradually lose weight. The first critical problem with the recommendation is the calorie level - our hypothetical woman above has a Basal Metabolic Rate calculated at 1900-calories a day. As the Discovery Health BMR Calculator page says "You expend energy no matter what you're doing, even when sleeping. Thus your Basal Metabolic Rate is the number of calories you'd burn if you stayed in bed all day...depriving yourself of food in hopes of losing weight also decreases your BMR, a foil to your intentions." But let's set that aside for this post and look at what she is presented with as a food plan and determine if it meets her nutrient requirements, as the site contends it will. First let's pretend she laughs off the idea of eating beans instead of meat - this makes our task of examining her protein intake easier since we'll be able to determine her intake of complete protein without having to adjust for the limiting amino acids in grains or legumes (beans). With 3-cups of milk and 5-ounces of meat, the total intake of complete protein (if this is followed to the letter) is 56-grams. Now, some would contend that this is above the 46g DRI (Dietary Reference Intake) established by the Institutes of Medicine for a 30-year old female. Such a contention fails to consider the IOM basis of 46g of complete protein is based on a female who weighs 128-pounds. Our hypothetical woman weighs 250-pounds! Protein intake - that is complete protein, providing all essential amino acids in the proper ratio - is based on the formula 0.8g/kg body weight. The IOM considers this the absolute minimum required each day. So, our hypothetical woman, who weighs 250-pounds is 113.6kg, thus requires a minimum of 91g of complete protein each day. But wait, you might say, she has other things she'll eat that provides protein! That is true. But, with 1800-calories, planned as recommended above, she'll consume about 80-90g of total protein, and depending upon what she actually eats, she is likely to miss adequate intake of all her essential amino acids; even with careful planning and optimal selections of whole foods, she'll also likely fail to meet DRI for Potassium, Vitamin D, Niacin, Magnesium, and Vitamin E; add to this she'll likely fail to meet omega-3 requirements while consuming an excess of omega-6. But hey, her saturated fat intake is just 6% of her calories, her cholesterol intake would be about 100mg, and her fiber intake in the neighborhood of 35g - according to the recommendations, she's eating a "healthy diet," and reducing her risk of disease by keeping her saturated fat and cholesterol intake below the maximum allowed. On paper her diet looks just great! In her body, in her metabolism, it's a nightmare if followed for any length of time. This is because chronic, habitual nutrient deficiency - whether it is a diet deficient in vitamins, minerals, or trace elements, essential amino acids, essential fatty acids, or a combination of deficiencies - places a burden on the metabolism to function without all of its needs. Oh, you won't die with a shortfall in nutrients; atleast not immediately...no, your metabolism will continue limping along, as best it can with what you give it to work with. But really, do you want to do that, or do you want to eat in a way that optimizes your metabolism? How about we design a menu for our hypothetical women, one for her, that is designed specifically to meet her nutrient requirements rather than conform to a set of percentages. Based on what we know her Basal Metabolic Rate is (what she needs for basic function before she gets moving each day), she should consume 1,900-2,000 calories and first focus on ensuring she eats 91g of complete protein each day. If we start there, and include as part of her day 4-ounces of lean roast beef, 16-ounces of plain whole milk yogurt, 3-ounces of tuna in oil, 2 eggs, and 1/4 cup shredded natural cheddar cheese - we've included all her complete protein for the day - 91g - and started her menu with 946-calories. We have 954-1054 more calories to add to her menu. Now we get to add in her vegetables, fruits and other foods to ensure she consumes adequate intake of the additional nutrients needed; the focus here should be first on vegetables since they're rich with vitamins, minerals and trace elements. Let's add to her menu a salad for lunch, with 2-cups of romaine, 6 cherry tomatoes, 1/2 a sliced cucumber, 1/2 cup shredded red cabbage, and some crimini mushrooms and we'll let her top it with olive oil and vinegar; then she'll have 1-cup of steamed broccoli at dinner with her roast beef and she can indulge and include 1-tablespoon of butter to make it taste good. As part of her breakfast, which includes the two eggs above, she'll also include 1-cup of baby spinach (raw amount to be added to egg omelet) and 1/4 cup of shredded cheddar cheese. Her breakfast will also include the one of the two cups of plain yogurt, in which she'll add 1-cup of strawberries. Her snacks during the day will include 1-ounce of almonds with 1-ounce of sesame seeds; she'll include 1-cup of blueberries with the other 1-cup of plain yogurt, add some water and have a delicious smoothie; and she'll have 1/2 an avocado too, perhaps with her lunch or just a snack during the day. At this point, her menu provides 1,931-calories. But wait, she hasn't included any grains! Surely this menu is going to be deficient for essential nutrients if she isn't eating grains! The above menu provides all essential nutrients, including fiber, with one notable exception - vitamin D, the most difficult nutrient to obtain from food. She can, of course, go out in the sun for 20-minutes this time of the year each day and make all the vitamin D she needs in her skin. In months where we cannot produce vitamin D in our skin, she can add a vitamin D supplement or make different choices with foods rich with vitamin D or include cod liver oil. But the above menu, even though it provides all essential nutrients, is a nightmare for those espousing the dietary recommendations - it's high in total fat, saturated fat and exceeds maximum allowance for cholesterol; the carbohydrate is lower than recommended (even though fiber is above recommendations), and it does not include any grains! Which begs the question - what would you rather eat? A menu designed to meet your calorie requirements to function before any activity but still a calorie deficit to enable weight loss - designed to provide all essential nutrients including the critical essential amino acids and essential fatty acids - or - a menu that looks pretty on paper but fails your endocrine system because it is nutritionally bankrupt? When searching online for topics to write about, I often hit google news and conduct a search based on various keyword combinations - diet, health, obesity, weight, diabetes - and I'm never disappointed by the sheer number of results. On Friday I noted that the headlines are often contradictory and those I posted were all within the first five pages of results using just two keywords - diet and health - in a search of the news headlines. So, what are we to make of dieting to lose weight? Is it a losing proposition? If it is, then why the repeated attempts to encourage the masses to diet? And, most importantly, does dieting really work? I think it's safe to say that the most widely recommended diet for weight loss - a calorie restricted, low-fat, carbohydrate rich diet - fails the test long-term. While intially reducing weight, in the long-term, such diets do little to improve health and enable a stable, lower weight over time. The failure of the dietary recommendations are no small matter, various agencies go to great pains to explain away the long-term failure and wind up making the issue one of personal failure rather than admit the flaw is in the recommendations. Whether or not an individual is able to lose weight and maintain the weight loss becomes a moral issue - having willpower over hunger, taking responsibility for portions, just eat less, just exercise more, stop buying junk food, etc. When the outcome is positive, the diet worked; when the outcome is negative, the person failed to follow directions. As Malcolm Evans summed up in his commentary, Dieting is Fine Because it is Becoming Official, "The argument goes like this - the state in its wisdom has spoken; overweight is a health issue and as such it becomes a moral issue concerning wellness, interdependencies and budgets. Weight is to be managed downwards and to disobey will result in an implicitly escalating scale of reputational and material penalties (including the denial of certain health care provision). Biomedicine currently prioritises a sense of cure over comfort. The emphasis in almost all cases is to be seen to be powerful in the chemical intervention, with much less emphasis on empathy in relation to the inevitable, or on the emotional and psychosomatic dimensions. It is a culture that allows ten minutes and the prescription of a tranquilliser. It is also a culture which disallows the complexity of overweight and seeks rapid intervention, preferably leading to the mapping of satisfactory digits to numbered targets. In the absence of a magic weight control pill (how Big Pharma would love to have one of those that was in any way remotely effective! ), dieting is perpetuated despite the accumulating evidence that it is a largely ineffective alone as a long-term solution." As I noted on Friday, Fred Hahn said it well, "Fat loss and health is NOT a numbers game - it's a hormonal game. And a game that requires full understanding of the rules." Yet the government and leading health organizations continue to perpetuate a dietary approach based on numbers - calories, fat grams, saturated fat grams, milligrams of cholesterol, sodium intake, fiber intake, the size of portions, and the number of minutes you engage in exercise each day. It's all about counting one or more things each day in your diet and lifestyle. All of the recommendations made to the masses come back to one single hypothesis - dietary fat is deadly and must be limited to not only keep calorie intake balanced - fat has nine calories per gram and carbohydrate and protein just four - but to prevent development of chronic disease. Recently the obession with total fat has relaxed a bit, from strictly maintaining an intake below 30% of calories, to an allowance now of a range between 20% and 35% of calories. But this concession comes with a stricter limit on saturated fat; we're now told to limit saturated fat to less than 7% of our calories, making it next to impossible to meet nutrient requirements for essential amino acids in those who are overweight or obese. Ah, the unintended consequences of playing, on paper, with macronutrient ratios. You see, if we take the recommendation to consume less saturated fat to heart, and also strictly limit our cholesterol intake as also recommended, we are left with significantly less animal foods in our diet each day, now dependent on plant-based sources of protein to meet our essential requirements for amino acids. Surely, you say, there must be strong evidence to support these recommendations? Surely we can easily meet our essential amino acid requirements with a plant-based diet? Surely a diet recommended by the government and leading health organizations must be soundly established by scientific data and be shown to lead to long-term outcomes in health and well-being? Here is where, as Fred Hahn called it, the "hormone game" comes into play and the rules are such that if you're not playing within them, your health suffers. The first, and most important rule you need to know in the "diet game" is eat your protein; and make it complete protein. Tomorrow I'll explain why and then discuss the other rules of the "hormone game" to give you insight into why everything we're told about diet is either wrong and causing more harm than good in your metabolism! Then, throughout the week, we'll sort out what to eat if you're trying to lose weight and improve your health for the long-term. Leftovers can help you eat a third less! Is it any wonder we're confused about how to lose weight? I sometimes wonder if the mass confusion, conflicting headlines, contrary opinions and such is by design. No, really, I'm not a conspiracy theorist...but, keep in mind, it is highly profitable to keep people fat, and sick, and coming back for more help isn't it? So, how do we cut through the confusion and contradictions and simply eat right? As Fred Hahn said it in a recent reply to comments on his blog regarding calories in, calories out - "Fat loss and health is NOT a numbers game - it's a hormonal game. And a game that requires full understanding of the rules." Monday we'll begin to lay out those rules! A Guidance Document open for public comments over at the FDA came to my attention this morning. The comment period ends April 30, 2007 and I strongly encourage my readers to take a few moments today to submit comments along with some additional follow-up. Draft Guidance for Industry on Complementary and Alternative Medicine Products and Their Regulation by the Food and Drug Administration, Docket No. 2006D-0480 is as detailed and vague as it gets. It seeks to "tie up loose ends" many feel exist in current regulation around approaches used in Complementary and Alternative Medicine (CAM) by establishing guidance for industry about communicating benefits of a "wide array of healthcare practices, products and therapies that are distinct from practices, products, and therapies used in 'conventional' or 'allopathic' medicine." 1. The guidance document, if finalized as written, will regulate virtually all herbs and supplements as drugs if they actually benefit a medical condition unless it is "generally recognized, among experts qualified by scientific training and experience to evaluate the safety and effectiveness of drugs, as safe and effective for use under the conditions prescribed, recommended, or suggested in the labeling." 2. The document, if finalized as written, is extremely vague as to the extent of regulatory reach. For example, the document states, as an example, that vegetable juice (yes, vegetable juice) "absent any claims that would make the juice subject to the drug definition, the juice would be a 'food' under section 201 (f) of the Act because it is used for food or drink for man." Now earlier in the document, in an attempt to define how vegetable juice might be defined as a drug, it is stated, "This means, for example, if a person decides to produce and sell raw vegetable juice for use in juice therapy to promote optimal health, that product is a food subject to the requirements for food in the Act and FDA regulations...If the juice therapy is intended for use as part of a disease treatment regimen instead of for the general wellness, the vegetable juice would be subject to regulation as a drug under the Act." The FDA defines a drug as "...(B) articles intended for the use in the diagnosis, cure, mitigation, treatment or prevention of disease in man or other animals; and (C) articles (other than food) intended to affect the structure or any function of the body of man or other animals..."
So, with that, any person (or product) that states "drink some vegetable juice to prevent [insert disease]" is making a drug claim; and if vegetable juice is not recognized by the FDA as a legally available drug in the United States, the person (or company) making the claim is now subject to prosecution if they are not a medical professional licensed to practice medicine. While it may seem unthinkable, consider this, as another blog highlighted, "[i]ts very specificity makes manifest fundamental inconsistencies and absurdities in the DSHEA law. If you substitute "water" for "cranberry tablets" and "severe dehydration" for "urinary tract infection," as found on Page 12, then you've turned water into a drug according to these guidelines. Obviously, the FDA would never turn water into a drug, but the guidelines allow them the option to do so. That "flexibility" alone makes the guidelines dangerous. In reality, what the guidelines do is extend the FDAs authority to arbitrarily decide when to enforce their will." The most alarming thing to me is the use of language throughout the document - the FDA sets the stage that anyone who is not a licensed healthcare professional (physician, nurse, DO, etc.) will be subject to prosecution for practicing medicine without a license because the terms used, "medicine" rather than modality, "treatment" rather than therapy. This is because of already established regulations and laws in all 50 states as to whom may "treat" medical conditions; these new regulations will specifically limit whom is able to communicate options to consumers to those holding a professional license. Any practitioner - homeopathic, naturopathic, reflexologist, Chinese or Ayruvedc practitioners, nutritionists, etc. - will all be at risk for practicing medicine without a license if they even suggest something like vegetable juice may prevent, treat or mitigate the symptoms of a disease. Which brings us back to the vague nature of the document...the specific language - everything termed as medicine and treatment - leaves the very real potential that any and all substances - vitamins, minerals, herbs, co-factors, probiotics, etc - could be classed drugs, new drugs, or medical devices if they are being recommended to prevent, treat, mitigate or cure disease states (remember water cures dehydration). While the media is silent on this, the FDA quietly awaits comments that few know are open. Well, now you know and now you can let the FDA know what you think - because if we do not comment we'll have no one to blame when we lose access to the vast options available to us right now. 1. Submit comments online. Be sure you include the Docket No 2006D-0480 with your comments. 4. In addition to the above comment submissions, write or call your representatives and senators! You can find the contact information for your representatives in the House and Senate here. I've been crazy busy the last few weeks, but absolutely had to stop what I was doing to write about an article today - The Atkins Paradox: What Diet Studies Don't Reveal - by Christopher Wanjek, the "Bad Medicine" columnist over at LiveScience.com. My headline above was taken directly from the column, "So why not go with Atkins if you can loose weight and eat bacon? The reason, most doctors say, is because there is something perverse about the Atkins diet." I haven't laughed so hard in, well, a few days. And, what followed was even funnier...Consider the breakfast of a gentleman on the Atkins diet whom I encounter each morning on a commuter train eating an entire block of baloney right out of the package with one hand and washing it down with a diet Coke in his other hand. Between the salt, fat and artificial additives in the lunchmeat and soda, this simply can't be healthy. I don't know about you, but when I read these stories about someone "on the Atkins diet" - or any carbohydrate restricted approach - doing it completely wrong, well all I can do is laugh. I'm not laughing because the poor fellow eating the bologna and diet coke breakfast is going about Atkins wrong, but because this columnist really, truly believes this guy is a good example to show how "perverse" the Atkins diet is. Not exactly a ringing endorsement of bologna for breakfast each day, huh? Then again, let's not let inconvenient facts get in the way of an article promoting low-fat diets are supreme! And this presentation of bologna & diet coke for breakfast for an Atkins dieter really isn't the biggest problem with this article. The Atkins and Ornish data have overlapping confidence intervals. This is a measure of statistical strength given sample size and other factors. The study implies that, with 95-percent confidence, the true weight loss could be as low as 6.8 pounds for the Atkins group and as high as 8.2 pounds for the Ornish group. In fact, the Ornish dieters were closing the gap at 12 months as the Atkins dieters were gaining weight. This supports earlier studies suggesting that a low-fat lifestyle is better at keeping off weight in the long run. Note that I've highlighted the Ornish group. I've done that because the contention that they "were closing the gap" and losing weight at 12-months is utter and complete hogwash. As a group, they were gaining weight since the two-month point in the study! Then the suggestion that the overlapping confidence interval was masking some secret weight loss potential for the Ornish group - more utter and complete hogwash. Oh, there was an over-lap all right, but no matter how you slice it, those trying to follow the Atkins diet lost as little as 6.8-pounds (3.1kg) and as much as 13.9-pounds (6.3kg), with an average weight loss of 10.3-pounds for the group. 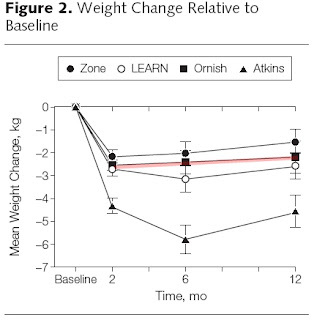 Compare that to those trying to follow the Ornish diet - weight loss was a little as1.8-pounds (0.8kg) and as much as 7.9-pounds (3.6kg) with an average weight loss of 4.8-pounds for the group. We're supposed to be convinced that those following Ornish were doing as well as those following (or trying to) Atkins? Oh yeah, that graphic above shows just how close the two dietary approaches were...not. Pass the nitrite-free bacon and double cream brie, thank you very much.